A great majority of European music written before 1750 is for voices but remains understudied and underperformed. It includes music for groups of voices and solo voices, with and without instruments, music for the church and the theater, for the court and the chamber, as well as music in different languages and with different national styles. 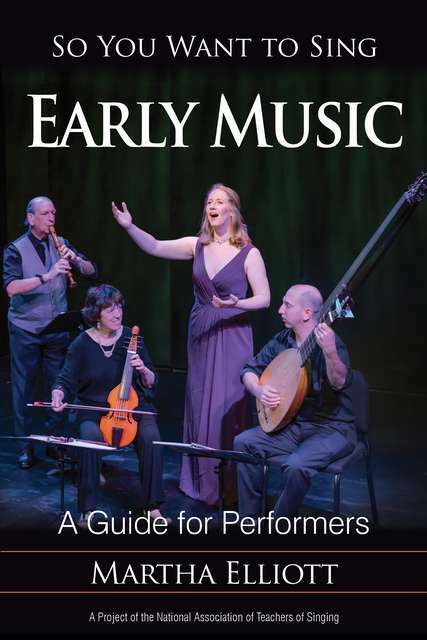 In So You Want to Sing Early Music, Martha Elliott introduces this remarkably rich and varied repertoire within a historical context for the 21st century singer. Focusing on music from the 17th and early 18th centuries, this book offers guidance on style and ornamentation, working with vocal and instrumental colleagues, reading manuscripts and edited editions of scores. Elliot shares advice for how to handle the different kinds of early music performance situations in which singers might find themselves, as well as where to find workshops and performance opportunities. Equally helpful to the classically trained solo singer or amateur choral singer, So You Want to Sing Early Music will allow them to broaden their repertoire and build their stylistic toolbox. Additional chapters by Scott McCoy and Wendy LeBorgne address universal questions of voice science, pedagogy, and vocal health,. The So You Want to Sing series is produced in partnership with the National Association of Teachers of Singing. Like all books in the series, So You Want to Sing Early Music features online supplemental material on the NATS website.